I love the Average True Range (ATR) indicator. Because unlike other trading indicators that measure momentum, trend direction, overbought levels, and etc. The ATR indicator is none of it. Instead, it’s something entirely different. And if used correctly, the Average True Range is one of the most powerful indicators you’ll come across. That’s why I’ve written this post to explain the awesomeness of the Average True Range indicator. The Average True Range is an indicator that measures volatility. It’s developed by J. Welles Wilder and was first mentioned in his book, New Concepts in Technical Analysis Systems (in 1978). Well, it’s done using 1 of 3 methods, depending on how the candles are formed. Example A: The current candle’s range is larger than the previous candle, we use method 1. 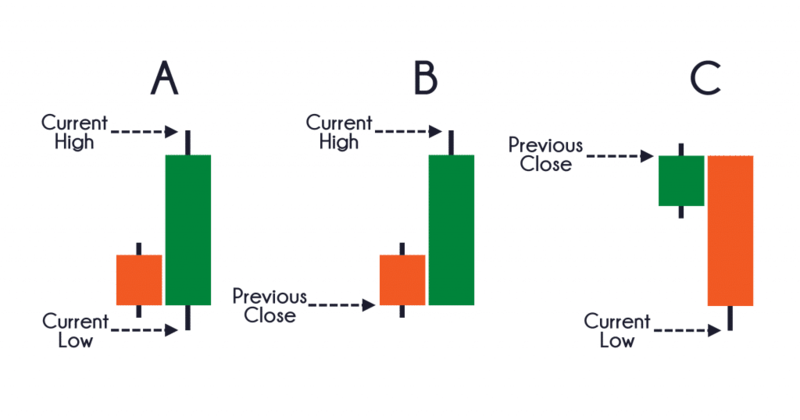 Example B: The current candle closes higher than the previous candle, we use method 2. Example C: The current candle closes lower than the previous candle, we use method 3. The larger the range of the candles, the greater the ATR value (and vice versa). A mistake traders make is to assume that volatility and trend go in the same direction. The Average True Range indicator measures the volatility of the market. This means volatility can be low while the market is trending higher (and vice versa). The volatility of the markets is always changing. It moves from a period of low volatility to high volatility (and vice versa). This means that when the market is in a low volatility period… you can expect volatility to pick up, soon. So, how do you use this knowledge to find explosive breakout trades before it occurs? Do you notice how these explosive moves occur after a period of low volatility? Have you ever put on a trade only to watch the market hit your stop loss, and then continue moving in your expected direction? And that’s because your stop loss is “too tight”. Give your trade room to breathe. This means your stop loss should be wide enough to accommodate the daily swings of the market. If you are long from Support and have a multiple of 1, then set your stop loss 1ATR below the lows of Support. Or if you’re short from Resistance, and have a multiple of 2 then set your stop loss 2ATR above the highs of Resistance. 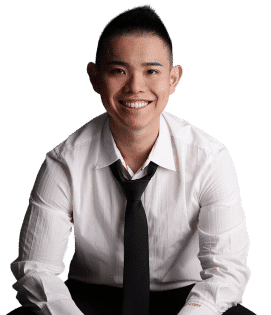 Then go watch this training video below where I’ll explain how to use the ATR indicator to set a proper stop loss – so you don’t get stopped out “too early”. If you want to ride massive trends in the markets, you must use a trailing stop loss on your trades. There are many ways to do it, but one of the popular methods is to use the ATR indicator to trail your stop loss. And to make your life easier, there’s a useful indicator called “Chandelier stops” which performs this function. Well, the truth is… there’s no best ATR multiple. If you use a smaller ATR multiple, then you’ll ride a small trend (and the time held on the trade is shorter). If you use a bigger ATR multiple, then you’ll ride a bigger trend (and the time held on the trade is longer). So which approach suits you best? Only you can answer that question yourself. Now if you don’t want to ride trends, you can also use the ATR indicator to set a target profit. You know the ATR indicator tells you how much a market can potentially move for the day. If EUR/USD has a daily ATR of 100 pips, it moves an average of 100 pips a day. This means if you’re a day trader, you can have a target profit of about 100 pips (give and take) and there’s a good chance it’ll be hit. Of course, you don’t want to “blindly” set a 100 pips target profit. Instead, combine it with market structure (like Support & Resistance, swing high & low, etc.) so you know where the price might reach for the day. Let’s say EUR/USD moves an average of 100 pips a day, again. You went long at support and you’re not sure where to take profits. There are 3 possible Resistance levels: 30 pips away, 80 pips away, and 200 pips away. The 30 pips target is likely to be hit within a day but you’re leaving money on the table as the market could move 100 pips a day. The 200 pips target is unlikely to be hit within a day (as it’s more than the ATR value). The 80 pips target is your best option as it’s within the daily ATR value (and offers more than 30 pips). If you trade longer-term, you can refer the weekly or monthly ATR value. I’m sure you agree nobody can work “forever” without exhaustion. After an hour or so, most of us will need a break to recharge. Because the market is just like you, it can only “work” for so long before taking a break. This means there’s a good probability the market will “exhaust” itself after hitting its limits. Well, you can find out using the Average True Range indicator. Now, I don’t suggest you trade this concept in isolation. Instead, combine it with Support & Resistance and you’ll find yourself identifying market reversals ahead of anyone else. And now, you realized GBPJPY has moved 500 pips (close to 2ATR) and it came into an area of Support. Then, it forms a large Bullish Engulfing pattern on the Daily timeframe. Now… what do you think will happen? Well, I can’t say for sure. But you have an “exhaustion” move, the price coming into an area of Support, and a Bullish candlestick pattern that signals the market could reverse higher. How do you use the Average True Range indicator? Leave a comment below and let me know your thoughts. It’s available for free on most charting package. But what settings are you using in ATR indicator ? Your example or illustration concentrated on Year-Low or Multi-Year Low and then Weekly and Daily. I expected you should’ve given example with lower Time Frames as well or is it only more credible with the higher Time Frames? Reason, we need to know if it’s safe to apply it in Day Trading in the same way you explained here. The concepts can be applied the same. You are basically identifying volatility contraction. pls kindly make a video, on ATR. Me and my group, do understand your video, more and more. Wanna confirm one thing. In your video on stop loss placement with ATR you mentioned about 2xATR from entry price but here you mentioned 1xATR from entry price. Any reason for this difference? And which one is best to follow 1xATR or 2xATR? I’m just illustrating the concept, that’s what matters. Ok.. Thanks. Got your point. Thanks for the wonderful video and article. When is the PATI coming out again. I was late to join. I’ll send an email update again when it’s open. This is a last point in your conclusion. When you say 2 ATR or more within a day what it means it’s in a day or in a candle ? The example you given in the weekly chart is showing within a candle. Please explain. The concept can be applied to daily weekly or monthly timeframe. Essentially, when the market exceeds 2 times ATR value, there’s a chance it could reverse from it. Tank you . Nice article. Very Good explained clear and short. Forgot to thank you for your EXCELLENT instructional videos. Your the best! Not that I know of. I do my scans manually. I’m not sure what your question is. Hello Rayner, what setup do you recommend? When you insert the number, what should it be? I mean automatically it´s 14, so it is for last 14 candles, right? What do you think is the most suited number for swing/position trading? There’s no best parameter. The concept is what matters. For USD/THB, the ATR 14 is 0.1256, is that 12 pips? That would be 120 pips. Hmm USD/THB one pip is 0.01, and since ATR is 0.1256, shouldn’t it be 12 pips? Yes, that would be correct. I’m wrong. i use 2 ATR as my stop-loss, which is about 100-200 pips. In this case, since the ATR is only 12 pips and 2 ATR is 24 pips, should I stick to 2 ATR or increase it to 9 or 10 ATR to make it over 100 pips? You should use the ATR based on the timeframe you’re trading. I’m not sure what your strategy is, but for most traders 3 – 4 ATR gives enough buffer for your trade. Hi Rayner, thanks for the post. Quick question I use yahoo finance charts, and the ATR at my entry point says 0.109 and I want to use a 4x multiplier, so that would be 0.436. And my entry price was $4.16. So then what would my stop loss be? I’m a little confused. Thanks! This is my first time of getting more confused after reading ur material (usually, I always understand when I read ur material )my problems are how do u get to apply the ATR indicator. You only have explained how the ATR works.